This entry was posted in Journal, Photography and tagged 2014, holidays, new year, New Years Eve, toast on January 8, 2014 by Shannon. My Thanksgiving turned out great. Jerrod and I helped Gramma with the turkey and it came out nicely. My rolls came out really well and it was my first time doing the mashed potatoes. I did them in two batches because they wouldn’t all fit in my mixer bowl, and the second batch was a little creamier than I intended, but they were really good. Papa used to do the potatoes every year, so I’m excited to be able to carry that on. My dad was sick with a virus and didn’t come over so as to contain his illness. I’m thankful for that(though I missed him being there). It’s awful to get sick while you’re pregnant! We read Psalm 33. I broke it up into sections and we went around the table with everyone reading some. Gramma requested reading around the table. She also wanted to sing the Doxology("Praise God from whom all blessings flow") as our prayer. After most people went home I watched A Charlie Brown Thanksgiving with Jerrod. Despite being our first Thanksgiving without Papa, it was a really good day. We are descended from two people who came on the Mayflower, and it’s so exciting to think of how far ahead God planned for them. Jerrod and I actually went to Plymouth(where the pilgrims landed) for our honeymoon. 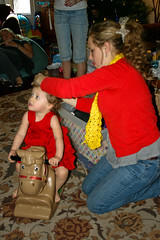 This entry was posted in Journal and tagged holidays, thanksgiving on November 26, 2010 by Shannon. I usually don’t do “what I’m thankful for” because I find it a bit cheesy, and what is there to say except what my scripture selection says? However, I wrote up some good ones this year. I am thankful for the grace of God and the blood of Jesus. Compared to how thankful I am for these, I am not thankful for anything else. My husband, Jerrod. He’s the best husband I could imagine and I can’t imagine having gone through what we have in the past couple years without him. Living with my grandparents, his help when they were sick, the time Papa fell outside and Gramma and I couldn’t help him up – I just don’t know what I would have done if I had been with them alone. And his support when Papa was in the hospital and when he passed away… I just can’t think of the words for how thankful I am. I give thanks to God for the new little baby girl we are expecting. I feel like I can already tell some of her personality. I am especially thankful this year for something a little unusual – That God caused Jerrod and I to move back in with my grandparents. I did not know then that I would be spending Papa’s last year with him. I wouldn’t trade that for anything. This entry was posted in Journal and tagged Bible, holidays, scripture, thanksgiving on November 25, 2010 by Shannon. For years, every Mother’s Day my mom would say “I’ll make lasagna.” I would say “No mom, you’re a mom. I’ll make the lasagna.” I’d start to make it, but then partway through I’d get sent to the store or something and she’d end up finishing it. I should mention that we were always at my grandmother’s house, so of course she wanted to do something for her mother too. This year was probably the most successful ever. 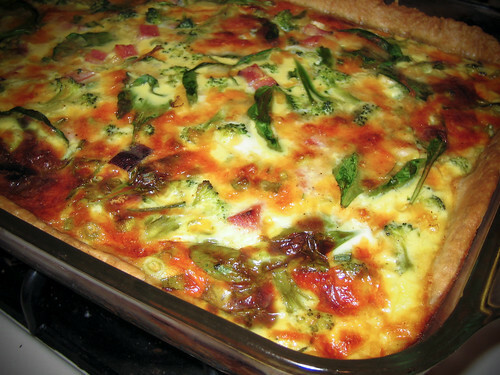 I made a big quiche, using the crust recipe from this quiche at smitten kitchen, and the quiche procedure from Alton Brown. I used ham, cheese, broccoli and spinach. The hardest part was how long to bake it! Since it was so big, I wasn’t sure how long it would take, and I debated a bit whether it was done or not. It turned out pretty well. Gramma said it was better than Polly’s and Marie Calendar’s. There’s just something wonderful about grandmothers, isn’t there? 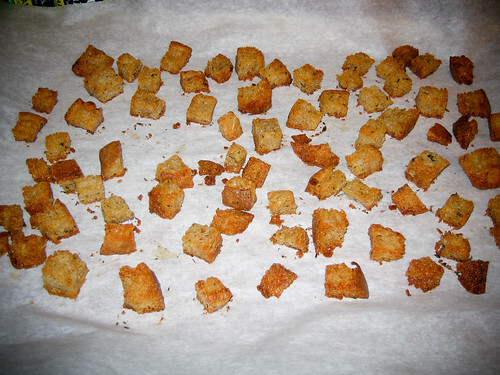 My mom loves croutons, so I put together a salad bar for which I made my own croutons. 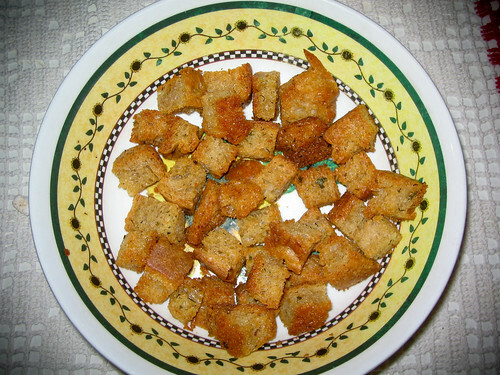 I’d never made croutons before, but I read lots of crouton recipes and came up with my own version. I used the end of a loaf of European Peasant Bread that I made earlier in the week. I cut up my bread and melted some butter in the microwave. I seasoned the butter with garlic salt, pepper, dill, and parsley. I put all the bread cubes in a ziploc bag, poured in the butter mixture and tossed the bread cubes in the bag. I lined a pan with parchment paper and dumped the bread cubes onto it, separating them so that none were on top of each other. I baked them in the oven at 350°F for about 16 minutes(poking at them every 8 minutes to see if they were crunchy), then turned it up to 375°F for about 10 more minutes. If I make them again I’ll probably try staying at 350°F for like 30 minutes or 375°F the whole time for like 25. I took them out of the oven and let them cool on the counter. They got alot harder as they cooled and became croutony. This entry was posted in Home, Kitchen and tagged baking, cooking, croutons, holidays, quiche, recipes on May 10, 2010 by Shannon. Technically I’m writing this very early on Saturday, and that’s what the date stamp will reflect, but I haven’t gone to bed yet, so I’ll be assuming it’s still Friday. My best friend will be working on Sunday(she works at a hospital) so she invited me to come with her to church’s Good Friday service at noon. I don’t normally go to her church but I’ve visited on multiple occasions and I actually went to preschool there. It was a pretty good service. Her church still has a traditional choir which was nice. My church doesn’t have one anymore and I do enjoy choral music. The music was good and there was plenty of scripture reading. Near the end of the service, one of the pastors led in prayer and invited people to accept Jesus as their savior. As we were praying I realized that that was where I had accepted Christ. There, in that very chapel in preschool. I knew of course that I accepted Christ in preschool and remembered it it quite vividly, but I hadn’t really thought about the fact that I was in the same place. How fitting, I thought, how wonderful to remember Jesus’ sacrifice on Good Friday in the very place where I came to Christ. That’s when I lost it. Then we took communion and that always makes me cry too. This entry was posted in Journal and tagged Bible, Easter, holidays on April 3, 2010 by Shannon. Christmas Eve is also my grandmother’s birthday so every year we go to the Christmas Eve service at my church and then we come home and have Gramma’s birthday dinner. A couple of really great things happened at the service. First of all, we took a cash only offering and the pastor said we were going to give it to someone outside our church family. Later in the service he started to say that he had told his wife that he would take care of Christmas Eve dinner. Then a pizza delivery guy came in and handed him some pizzas he asked his name, the guy says he’s Zach, asks how much it is and the guy says it’s $20. He hands him some money and then the pastor says “We took a little tip earlier, I think there’s about $2300 in there. Merry Christmas.” I was totally not expecting it! I thought it was a really good idea. I prayed that it worked out well for that delivery kid when he got back to the pizza place. Another thing I’d like to share, is related to my volunteer work at MOPS(Mothers Of Preschoolers). I lead the song and snack time there, the kids are 2-5 and this semester I taught them Away in a Manger which they sang for their moms on the last day. I actually did the first and third verses with them, which most people wouldn’t do. During the Christmas Eve service the worship leader brought all the kids up front, asked them questions, etc and then they sang some songs. They came to Away in a Manger and one of the little boys I teach is doing the hand motions, I look over to the other side, and some of the little girls I teach are over there singing clearly. They move on to the other verses and most of the kids don’t know it. When they get to the third verse, my MOPS kids are doing the best of all! One of the girls is singing strongly and the worship leader gives her the microphone. She sang a good part of the verse. I was so excited and proud of the kids, I teared up a little. We needed to get to my uncle’s house before my cousin left for her mom’s house, so we woke up at 8:30 and my husband and I exchanged our gifts to each other. We were low on stocking stuffers this year, all I had for Jerrod was a bag of Starburst Favereds, but he didn’t have anything for me so it was okay. 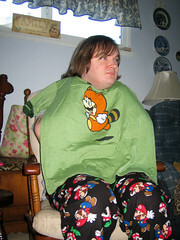 I gave him a Tanooki Mario shirt. 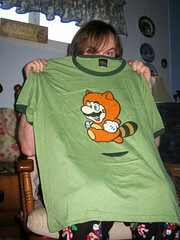 The tanooki suit from Mario 3 is his favorite. 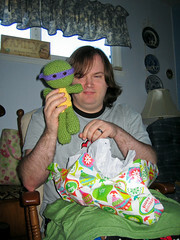 I also crocheted him a Teenage Mutant Ninja Turtle. 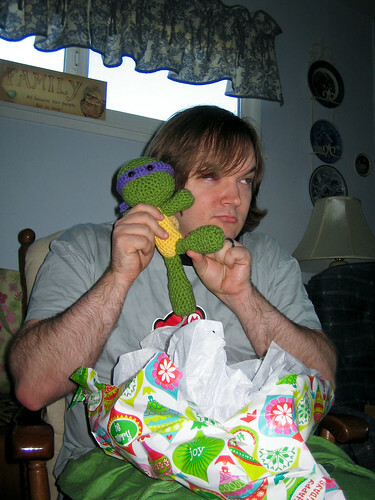 It’s Donatello which is his favorite. It was really hard to get it finished without him seeing it, but he really liked it. Then we went over to my uncle’s house. 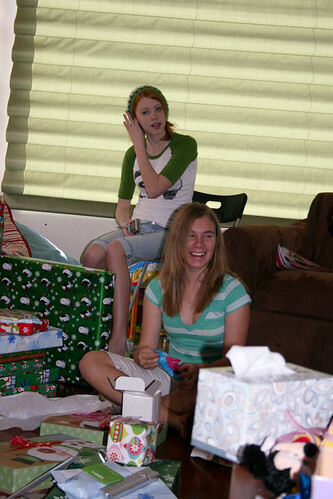 My cousin Sidney opened her present from me first. My present for her was a case for the iPod touch I knew she was getting. When I showed it to my mom she said that my cousin is “Just junior high enough” that she might not know what it’s for and I should put in an iPod cutout. On Christmas Eve Sidney told me that she knows everything. The following is an account of the conversation when I gave it to her. Sidney opens her box and there’s a brief pause. My Mom: See, I told you. Me: It’s an iPod case. My Mom: You should have put in an iPod touch cutout. Me: I was going to, but then yesterday she told me that she knows everything! 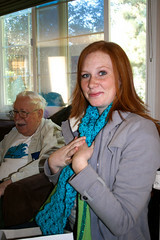 My sisters both seemed to like their scarves. 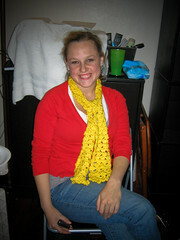 Holly said she didn’t have a yellow scarf and wore it for the rest of the day and today when we met for lunch she was wearing it again. 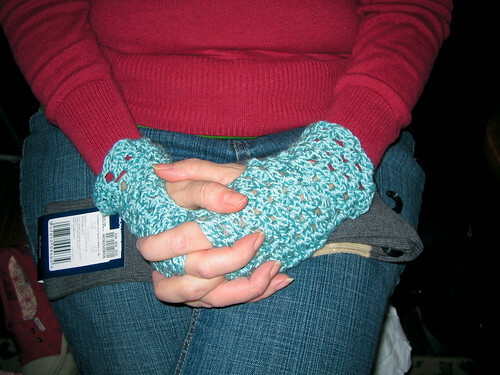 My mom wore her wrist warmers, too! 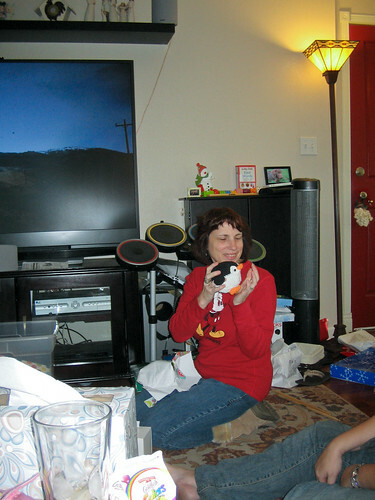 My aunt Melodee seemed really happy with the Penguin I made her. Before dinner, I read the Christmas story. I read from Matthew since they read from Luke in church the night before. 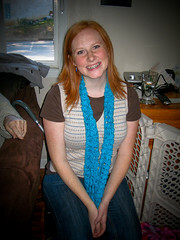 This entry was posted in Journal and tagged Christmas, crochet, holidays on December 27, 2009 by Shannon. Talk Like a Pirate Day was this Tuesday, of course. Tuesday was also our first day of MOPS, which is a church program I volunteer at called Mothers of Preschoolers. The mothers come and bring their small children and we watch them and the moms get to enjoy a morning of speakers, crafts, and fellowship. I’m not entirely sure what, actually, because I’ve never seen what the moms do. Anyway, I’m in charge of Song and Snack time at MOPS now, so I get every group of the older kids and give them their snack and then we sing songs. I had three groups for Song and Snack and while they were having snack I asked them if they knew it was Talk like a Pirate Day. I was usually met with blank stares, but then I said what do pirates say? and in every group there was one kid that said “arrr!” But there was one little girl that could actually carry on a whole pirate conversation, and it was great! She knew “Ahoy Mateys!” and talked about walking down the plank and being “shark bait”, and on her own she said “Shiver me timbers!” That was the last straw and I just laughed hysterically. This entry was posted in Journal and tagged holidays, kid quotes, pirates, Talk Like A Pirate Day on September 21, 2006 by Shannon. Today is St. Patrick’s Day. I was just thinking today about a Veggietales video I saw a while ago. There was a short cartoon on Sumo of the Opera about St. Patrick’s Day. It was done in this cute 2-D sort of style. A bit like a flannel board, except that things moved. Anyway, it told the story of St. Patrick and how as a young boy he was kidnapped from England by pirates and sold to slavery in Ireland, where he encountered Druids. Druids, of course, worship trees(I realize that is the short explaination). The cartoon went on to tell how he escaped and studied and became a Priest and dreamed that Ireland was calling him and he eventually went back and shared Christianity with the Irish. He used a shamrock(three leaves) to illustrate the Trinity to the people. This makes me wonder why the four-leafed clover is supposed to be so lucky. This goes back to my daily reminder to myself; I’ll take the grace of God over luck any day. At any rate, I was glad to learn that St. Patrick was essentially a missionary. It is my belief that sharing Christ with people is one of the best things that we can celebrate. 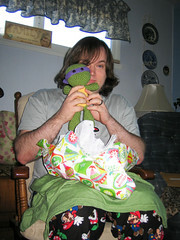 This entry was posted in Journal and tagged holidays, St. Patrick's Day, veggietales on March 18, 2006 by Shannon. Ahoy, maties. It be Talk like a Pirate Day. Let’s take some time to review the basic TLAP jargon. Ye should not be forgettin’ to talk like a pirate today. A pirate page translater! Type in the URL of yer favorite site and get it back in pirate talk. Users of the WordPress blogging tool can pick up a text-to-pirate filter from Dougal Campbell’s Geek Ramblings blog. This entry was posted in Uncategorized and tagged holidays, pirates, Talk Like A Pirate Day on September 19, 2005 by Shannon. and if Christ has not been raised, then our preaching is vain, your faith also is vain. Moreover we are even found to be false witnesses of God, because we testified against God that He raised Christ, whom He did not raise, if in fact the dead are not raised. and if Christ has not been raised, your faith is worthless; you are still in your sins. If we have hoped in Christ in this life only, we are of all men most to be pitied. But now Christ has been raised from the dead, the first fruits of those who are asleep. For since by a man came death, by a man also came the resurrection of the dead. For as in Adam all die, so also in Christ all will be made alive. This entry was posted in Uncategorized and tagged Bible, Easter, holidays, resurrection on March 26, 2005 by Shannon.